An Evening with Former President of Mauritius her Excellency Ameenah Gurib-Fakim. 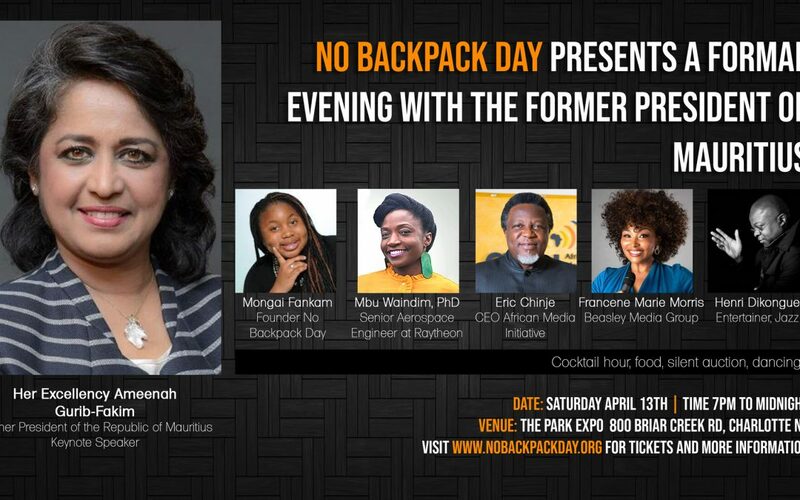 No Backpack Day presents an evening with the Former President of Mauritius featuring Cameroon famous musician Henri Dikongue, Senior Aerospace Engineer at Raytheon, Mbu Waindin, Ph. D, Eric Chinje, CEO African Media Initiative, Francene Marie Morris, Beasley Media Group and Founder No Backpack Day Ms. Mongai Fankam. 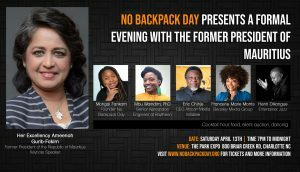 This event is a continuation of Ms. Mongai Fankam’s quest to Change the world one backpack at a time. I was going through my pictures of my first mission trip and subsequent trips. There is a picture of me carrying an AIDS orphan who was in an orphanage that we had visited. We learned that the baby was 2 months old and had lost both parents.